I understand that there are several characteristics of curly hair which differ from straight hair (such as an asymmetrical distribution of disulphide bonds in curly hair), but really am struggling to understand the root cause of inherent curl on the macroscopic level. The most relevant part of the hair for our discussion is the cortex, which is made up of many axially aligned macrofibrils, or macroscopic keratin fibers, which are in some filler essentially of lipids/proteins. Inside these macrofibrils are microfibrils. These are also aligned axially and in some filler of lipids/ proteins. Inside the microfibrils are the protofibrils, even smaller fibers which are twisted around each other like a yarn. These protofibrils are made up of 4 keratin chains which are essentially twisted together and connected by disulphide bonds and hydrogen bonds. 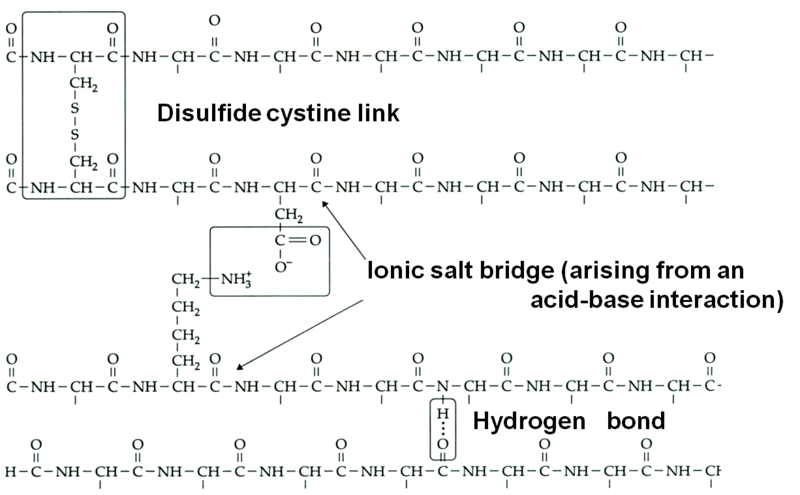 While hydrogen bonds are easily broken, the disulphide bonds are not. In curled hair, the macrofibril isn't symmetrical but I am unsure as to how this, or what other effects, actually lead to the curling. 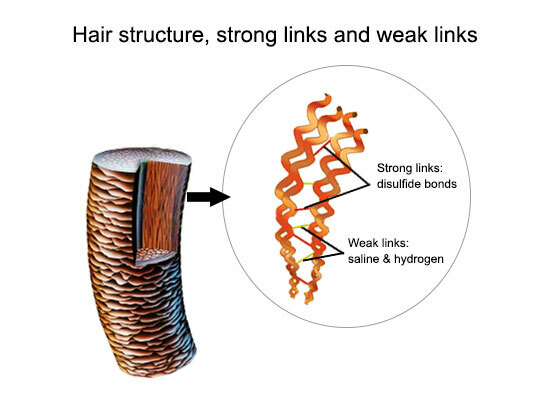 I had previously assumed that the reason for curling is that in an asymmetrical configuration of the hair(IE not cylindrical but more oval in cross section), some residual stresses are formed by the disulphide bonds between the keratin, If this is true, it would lead me to believe that it would cause increased buckling of the protofibrils. But, even with straight hair and more symmetrical disulphide bonds, you already have some curling and buckling of the protofibrils, but the hair doesn't curl on a macroscopic level. As such, it doesnt seem like this buckling due to asymetrical disulphide bonds would necessarily lead to a curled or organized structure on the macroscale, with the macrofibrils. This leads me to believe I am missing something. Nice question. I must say it took me many hours to get satisfactory answer. Curling of hair can be justified on both microscopic and macroscopic level. Curly hair has to do with the chemical bonds in the protein that makes up hair - $\alpha$-keratin. Keratins, particularly $\alpha$-keratin, have long sequences of amino acids (often more than 300) which forms a helical structure. Pairs of these helical structures then coil about each other in a left-hand coiled-coil structure. These are then attracted to another coiled coil so two keratin helices will stick together. These four-chain structures then associates with another four-chain structure to form the hair filament. One of the amino acids which make up these chains, is cysteine which has a sulpher group which is able to make connections with other sulpher groups on other coiled coils. The more interactions a filament has with another filament, the more tightly coiled the coiled-coil becomes. Hence, curly hair has more interactions than straight hair. The process of `perming' hair introduces more accessibility of the sulpher on the amino acid, cysteine, to make these connections. Finger and toe nails have many many bonds between filaments and are thus, very hard. For example, see how hairs are curled artificially via perming. 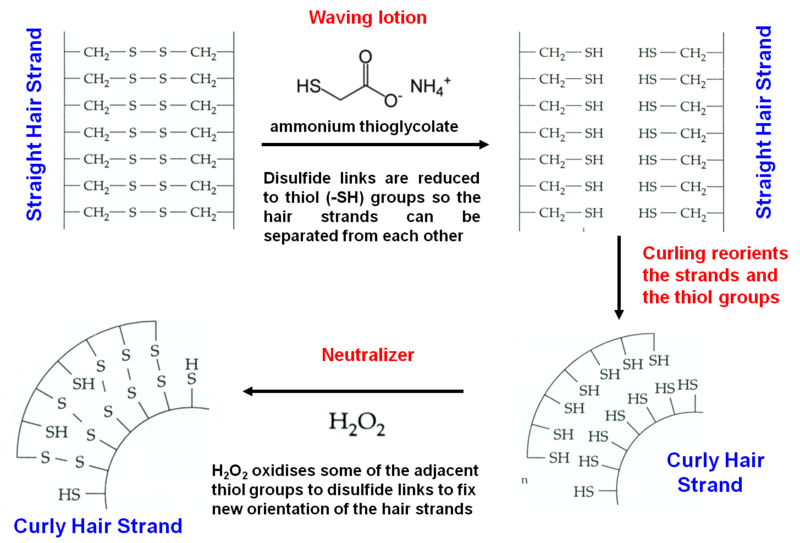 This change in location of bonds is what causes curling of the hair (look again at the first diagram and notice the orientation of disulfide bridges). Those vertical strands now get curled due to change in these bonds. Here, the required mechanical tension for bending is provided artificially. 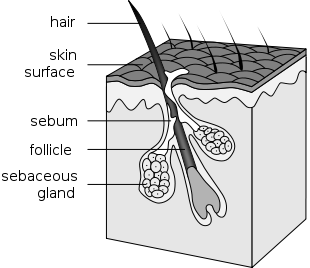 Although how shape of follicle determines structure of hair strand is probably not known, the major contributing factor likely is how hair emerges from the scalp. When it emerges in a bent shape, it faces a lot of tension from the scalp, which causes it to bend in the shape of the follicle to form curls. Since straight-emerging strands don't face such forces, they do not lead to curled hairs. In this way, hair curls are a consequence of large number of disulfide bridges between keratin molecules and how the hair emerges from the scalp. Not the answer you're looking for? Browse other questions tagged biochemistry hair bio-mechanics biomedical-engineering or ask your own question. Approximately how thick is a single strand of cat (domestic housecat) hair? Cut strand of hair longevity? 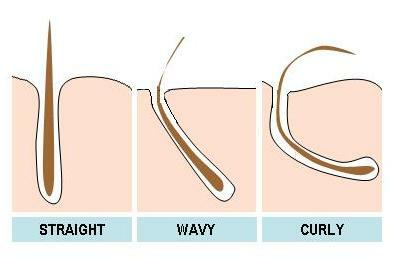 What determines the length to which hair grows? Do pulled hair from the root grow back? How can I extract DNA from horse hair?